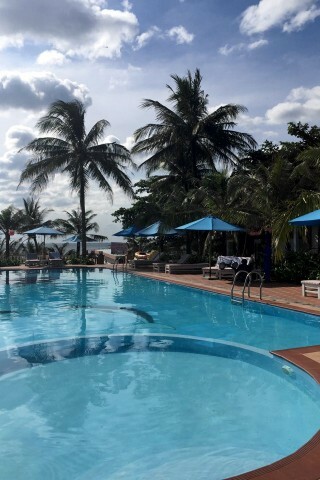 Orange Resort caters more to Vietnamese tourists than foreigners. Ad Book now! Rates from US$52.57++. Average rating 8 from 320 reviews. You may be willing to overlook the stiff management and lacklustre service once you learn this resort has beachfront bungalows with large sliding glass doors that will literally have you tumbling out of bed and into the ocean. The other star is the enormous pool at the centre with views to the sea. Rooms have been refurbished and are comfortable but the generic style won’t wow you. They have white walls, beige curtains, a few bits of furniture and a mini flatscreen TV. It is brightly lit, both from the windows allowing for natural light and pot lights. Bathrooms are disappointing. There’s nothing wrong but there’s also nothing great about it. We chose to review Orange Resort because Long Beach has surprisingly few beachfront properties with rooms directly on the sand that face the water, plus with such a large pool – some travellers may be sold on these two features alone. But it is a three-star tops at a four-star price making it poor value. Like the rest of Long Beach, you have to spend more to get an acceptable level of amenities and beachfront location. When we visited in December 2015, there was construction in the adjacent property. This is something that any property on booming Long Beach may have to contend with – best to check the latest situation. Check rates at Orange Resort on Booking.com. Room: Superior double room, low season: 2,200,000 dong, high season 2,500,000 dong. Notes: Beachfront: 2,700,000/3,000,000 dong.